12 July 2018, 16:04 p.m. 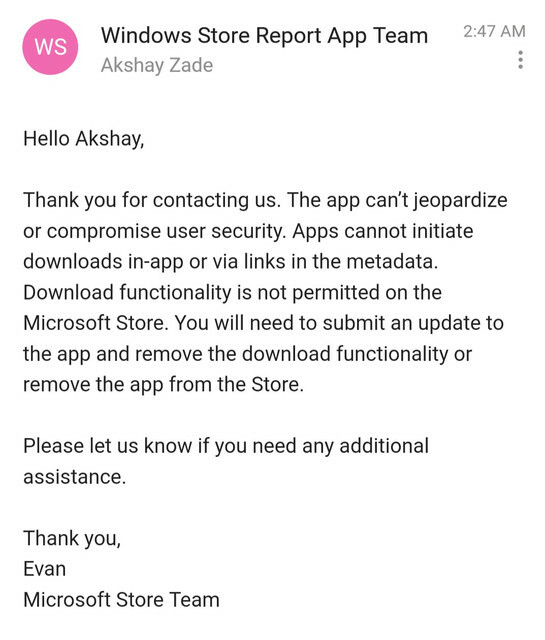 Developers are finding their apps in the Microsoft Store are being prevented from downloading external content such as images and videos. The downloads banned from the app were, presumably, videos and photos from Imgur. Akshay Zade, the developer of Monocle Giraffe, says he’ll be forced to disable the download functionality. Downloading external content is a standard feature of many apps on various platforms. Even on iOS, which has a reputation for its restrictions, users can download things such as images and videos through apps. The developer of the Mojave Dynamic Desktop app for Windows 10 also received a similar email from Microsoft. Microsoft is doing its best to attract developers to its Store with initiatives such as Project Centennial, which lets regular Win32 apps be hosted on it. Implementing restrictions like this doesn’t seem to make a lot of sense. What are your thoughts on Microsoft’s apparent download restrictions? Let us know in the comments.